Cornwall Council’s ‘big idea’: Growth. Lots of it. And then more. 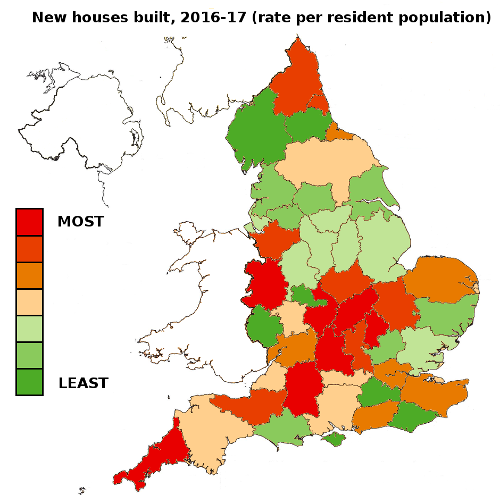 | Cornwall – a developers' paradise? Cornwall Council’s ‘big idea’: Growth. Lots of it. And then more. The ‘big idea’ at the core of the Council’s strategy is ‘growth’. Perhaps the Council’s ideological gurus, most brought into Cornwall at great expense, think this is a new idea. I suppose we can’t blame them for being ignorant of our recent history. 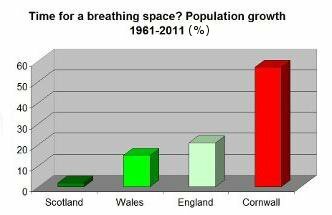 More curiously, no-one at County Hall seems to have bothered to inform them that Cornish communities have actually experienced quite a bit of growth since the 1960s. Yet, puzzlingly, we still have chronically low wages, problems in finding affordable places to live, congested roads and town centres populated by charity shops, hair salons and wailing shopkeepers bemoaning deserted streets. The project class and assorted career escalator types at the top are thus surprised that the ungrateful masses are less than overjoyed by the prospect of even more ‘growth’. They then cast around for ways to try to make it more acceptable. Their advisors persuade them that this can be achieved through the simple device of prefixing words like ‘environmental’, ‘sustainable’, ‘clean’, ‘inclusive’ in front of ‘growth’. Of course, these remain essentially meaningless, as nowhere is the difference spelled out between ‘environmental’ or ‘sustainable’ growth and plain old ‘growth’. A re-packaged ‘growth’ is then placed within the sort of visionary language that most people would agree with, but that remains to all intents and purposes vacuous. Take the Council’s New Frontiers Appendix 1. This is the basis for their bid to central government for a second ‘devolution deal’. It provides an excellent window into the Cornwall’s real thinking. With a fine sense of irony, it begins ‘Our peninsula is a beautiful and fragile eco-system in which the resilience of our people, environment and economy are inter-dependent’ (p.1). So what should we do with it? Well, let’s build on it at an historically unprecedented rate for starters. This is described as ‘sustainable, inclusive growth that delivers the very best outcomes for everyone living in our region’ (p.4). And, of course, a lot of people who don’t yet live in it, although the document strangely doesn’t get around to mentioning that. While camouflaged by touchy-feely words, the Council can’t be accused of not being upfront in this document. Confident that few people outside the leadership bubble, central government or the Council will ever read it, there’s no need for the shifty defensiveness more normally seen in strategic planning documents. It’s ‘growth’. Full stop. The challenge is to ‘ensure the continuation of economic growth’ (p.6). The word ‘growth’ appears 119 times in this 56-page document. Growth won’t just be economic; it’ll transform everything. ‘The social benefits of growth must also not be underplayed and we need to ensure that our natural capital grows with it’ (p.7), the document obscurely adds. Nowhere however do the authors of New Frontiers explain how and why the growth we’ve already seen over the past half century and more hasn’t already had the desired effect. Why will miraculous outcomes and all-round joy and happiness flow from growth while the growth of the last half-century produced the problems the growth of the next half-century is supposed to solve? Sixty years or so of some of the highest proportionate in-migration and housebuilding rates in the UK has produced merely a sullen native population glued to their tellies, a mass of consumerist zombies, a new population that seems to survive by grooming each other’s dogs, a seething mass of angry and disaffected Brexit voters, and an unseen minority that indulges in the new sport of consuming fast food and then adding to growing air quality issues by touring the countryside to find a spot to chuck the packaging out? Are these the ‘social benefits of growth’? Dig deeper in flighty documents of fancy such as New Frontiers and we discover an altogether seedier reality underlies its Orwellian massaging of ‘growth’. Return tomorrow for the next exciting instalment and see how Cornwall Council wants to see even more houses built on all that useless green stuff out there in order to ‘accommodate’ even more people, who will then drive ‘growth’. 3 Responses to Cornwall Council’s ‘big idea’: Growth. Lots of it. And then more. Pingback: Cornwall Council’s love affair with housing and population growth | Cornwall – a developers' paradise? Pingback: The problems with Cornwall Council’s growth obsession | Cornwall – a developers' paradise?